If you are worried about what you need to get before you take your puppy home and all of those ‘little questions’ that are at the back of your mind, why not come and attend the Kindergarten Class. Here you will spend an hour with other people’s pups, getting ‘hands on experience’. You can chat to other owners and get an insight in to what you can expect and will need to do. This will prepare you and when the big day arrives you will be several steps ahead and be in full control! The Kindergarten Class is an hour long and once the little pups have gone home you will have a further 30 minutes to chat to us and ask any questions. We give you handouts, which will be very beneficial to you, which deal with a wide range of subjects from ‘crate training’ to ‘your dog and the law’. We also offer home visits if you so choose so that we can best advise you how to puppy proof your home and your garden. That way you can ensure the health and safety of your puppy as well as your prized possessions! Home visits can be arranged to suit you. Which breed have you chosen? Tip Top Dog School’s Kindergarten – what makes us different from puppy parties? 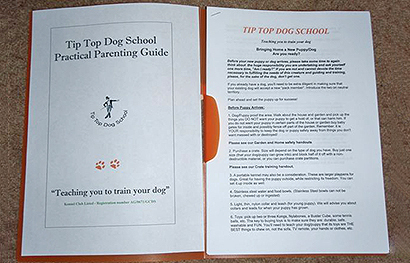 At Tip Top our aim is to start your puppy off in the right direction. We do NOT allow non-stop play between pups as this can set up problems in your pup’s development. It can cause bullying, making some bullies and some underdogs or ‘victims’ and make your pup so ‘ dog focused’ that it will not listen to you. Socialisation is the process by which puppies learn to relate to people and other animals. It means meeting and having pleasant encounters with as many other adults, children, dogs (puppies and adults), and other animals as possible. It also involves becoming used to a wide range of events, environments and situations. When you take on a puppy, you are taking on the responsibility to ensure your dog grows up to be emotionally well- adjusted. Puppies that are not socialised may grow up to be fearful, and fearful dogs may bite. Dogs not used to different environments and situations spend their lives being frightened when taken to unfamiliar places. Well-socialised puppies grow up to be friendly and happy in the company of people and other animals, and make successful pets. Dogs taken out regularly as puppies can take different situations in their stride and enjoy going anywhere with their owners. We strike a balance between play and work .At 8 weeks of age your puppy is more than ready learn in short bursts how to ‘sit’, walk on a lead,’ come’ when called and ‘leave it’ etc. The ability to be handled by everyone is of paramount importance. 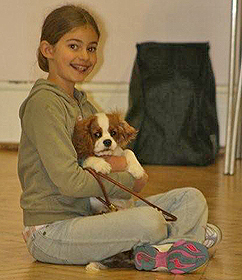 It is quite easy-and thoroughly enjoyable-to teach young puppies to like being handled and examined by people. We use a technique we call ‘the puppy relaxation position’ and once mastered will help prevent all sorts of problems with puppy biting, grooming, visits to the vets and groomers and, most importantly, being around children. We also deal with toilet training and puppy biting and any other issues that crop up. A good start as a puppy will make your dog become a well balanced and socialised dog that can cope with all sorts of situations, meeting different people and being focused on you. Tip Top offers a very personal service and we pride ourselves on our back up and after care.